Jupiter, the solar system's largest planet, is turning out to be as majestic as its ancient name implies. High definition images taken of its poles, transmitted back to Earth by the space probe Juno, show a vibrant, churning cloudscape which appear to have been artistically generated in oils (1). The gnarly appearance of the storms and tempests which are woven into this mind-blowingly immense vista seem peaceful enough from space, but the ferocity of their winds can only be imagined. Although the colours have been enhanced to a certain extent artificially (2), Juno's imaging equipment has captured the incredibly beautiful blue colours of the polar zones and the immense set of storms swirling within. These dramatic regions contrast strongly with the generally dull series of beige bands wrapping around the more familiar equatorial region (although Juno has also allowed us to better appreciate the intricate patterns of these banded zones, too) . These blues are more reminiscent of the ice giants Neptune and Uranus, and perhaps even of Earth - although the constituent gases of the atmospheres of these worlds can differ significantly from Jupiter's. The different colours and properties of Jupiter's clouds can be attributed to their constituent gases - mostly hydrogen and helium, but also water, ammonia, methane and sulphur. It seems to me that the solar system is starting to come to life - not in the way of biological life, although that may yet come to be, but instead in terms of our appreciation of its rich complexity and visuality. The Pioneer and Voyager space probes provided what were incredible images of the outer solar system planets back in their day. But limitations in the image-capturing technology also created a sense in those images of dull uniformity. In the decades before the space-probe images had been sent back from the outer solar system, sci-fi writers, film-makers and scientists had created an amazing array of ideas about what these worlds might be like. This potential had become ingrained within the public collective consciousness, and to some extent helped drive NASA's ambitious space programme forward. This was enhanced by a sense of mystery - and a hope of alien life. However, the images returning to our television screens in the latter part of the 20th century clearly did not do these worlds justice. So, although obtaining the planetary images were astonishing achievements in themselves (3), the disappointing lack of features within them dashed many hopes, and provided the public with a new view of the outer solar system. Like lifeless Mars and overheated Venus, the outer solar system consisted of a rather mundane set of giant planets distinctly lacking in the vibrant complexity of our own Earth. But the 21st century has brought renewed vigour to this visual record of our solar system. Cassini's long mission to Saturn and its moons provided stunning images of great beauty, as well as the realisation of the existence of liquid water bursting out of the moon Enceladus. Saturn's weird hexagonal patterning over its north pole broke the established mould of beige uniformity for the gas giants. Then New Horizons' flyby of Pluto presented a multiplicity of surface features which few had dared to dream of. Now, Juno has sent us these incredible images of the incredibly complex cloudscapes of our solar system's largest known planet. It feels as though the solar system is beginning to reveal itself in a new way - showing a complex and unpredictable side to itself which is both tantalizing, and also rather wonderful. "Jupiter has the most powerful auroras in the solar system, so the team was not surprised that electric potentials play a role in their generation. 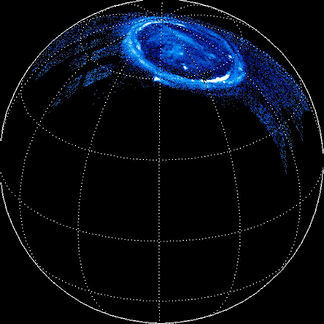 What’s puzzling the researchers, [Barry] Mauk [of the Johns Hopkins University Applied Physics Laboratory (APL), Laurel, Maryland] is that despite the magnitudes of these potentials at Jupiter, they are observed only sometimes and are not the source of the most intense auroras, as they are at Earth. Juno appears to be observing two processes at play: A distinct, high-energy, downward, discrete electron acceleration in Jupiter’s auroral polar regions; as well as upward magnetic-field-aligned electric potentials of up to 400,00 electronvolts. This latter electrical potential is an order of magnitude greater than the largest potentials observed on Earth (5). Jupiter's own ability to accelerate high-energy electrons may indicate the process which, taken up to a larger scale, becomes capable of converting gas giant planets like Jupiter into dwarf stars. If this is what is happening on Jupiter, then perhaps we can extrapolate further upwards for the kinds of particle acceleration processes that must be occurring within its more massive cousins, the sub-brown dwarfs, and onwards to the broad category of brown dwarf 'stars'. These failed stars would seem quite capable, then, of generating even more potent aurora displays from their immense magnetic and electrical fields. Brown dwarfs, like their less massive gas giant cousins, are thought to generate strong fields by a convection-driven dynamo process within their electrically conducting interiors (6). Dynamos occur when the interior of the body rotates faster than its surface layer. This accelerates electrons to create magnetic forces and thus magnetic fields within and around the star or planet. Brown dwarfs sometimes seem to be a lot more like stars than planets, even though the processes by which they emit their dim light are very different from the nuclear fusion driving stars. For instance, brown dwarfs can exhibit surprisingly strong surface magnetic fields and, more importantly, these fields can show unexpectedly high levels of disturbance (9). In a way, all of this tells us something we already know - brown dwarfs sometimes behave like stars, sometimes more like gas giant planets like Jupiter. What we're perhaps now appreciating is that Jupiter itself is more complex than had previously been imagined. Brazilian astronomers have discovered what they think is the aftermath of a vampire brown dwarf attack. 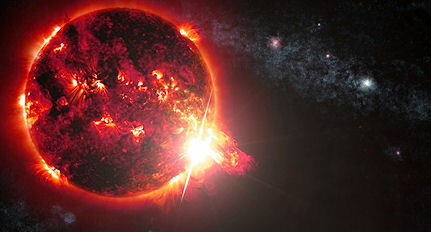 A main sequence star, coming towards the end of its life, has had its lifeblood sucked out of it by its companion. The result is an enfeebled white dwarf core, where a proud red giant once stood. Its blood-sucking companion, an enlarged brown dwarf, continues to encircle this ghostly helium core, as a binary dwarf couple. 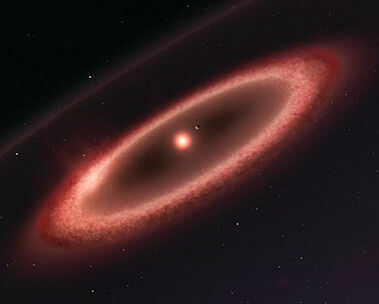 The action took place when the original star aged to the point where it began to swell into a red giant, entirely enveloping its brown dwarf companion. Brown dwarfs age more slowly than their mainstream equivalents, so it was far from the end of its own life at that time. What's interesting, though, is that the brown dwarf companion accumulated the materials from the red giant's outer layers, and began to grow. A critical point was then reached when this death star's own burgeoning gravity stripped away the outer stellar layers of the parent star, causing its victim to collapse into a white dwarf. But the vampiric brown dwarf had not itself drained away enough matter to spark into life as a 'proper' star. The result is a curious binary couple consisting of a brown and a white dwarf. This tiny binary system, located in the constellation Perseus, has been studied over a number of years by astronomers based at the Pico dos Dias Observatory in Brazópolis (1). It is smallest example yet of an HW Vir system, which are rare evolved eclipsing binaries composed by a hot compact star and a low-mass main-sequence star in a close orbit (2). This odd scenario illustrates how giant planets/failed stars might continue to accumulate materials in unusual ways during their long lifetimes. Due to their intrinsic longevity as failed stars, they are able to outlive early stellar companions within binary systems. This case indicates that if brown dwarfs are lying close enough to their dying companion star, they may benefit directly from the ensuing death throes. In same situations, the brown dwarf may accumulate enough material to ignite as a red dwarf - rising like a phoenix from its companion's ashes. This shows how the long lifecycles of dwarf stars may include non-linear episodes of accretion. It's an Earth Mystery; literally. New research has shown a statistically significant correlation between the occasional periodic slowing of the mean rate of rotation of the Earth, and subsequent surges in major earthquake activity. Given that we have just experienced one of these miniscule periodic events in 2011 (blink and you missed it), it looks like we might be due for a bumper crop of major earthquakes in 2018, and for the next few following years. Although it's unclear where the earthquakes may occur, previous patterns indicate that the equatorial regions are likely most at risk. But the change in the rate of rotational velocity is tiny - just a millisecond per day. So, how could this drive such violent geophysical activity? "Although such fluctuations in rotation are small – changing the length of the day by a millisecond – they could still be implicated in the release of vast amounts of underground energy, it is argued. The link between Earth’s rotation and seismic activity was highlighted last month in a paper by Roger Bilham of the University of Colorado in Boulder and Rebecca Bendick of the University of Montana in Missoula presented at the annual meeting of the Geological Society of America. This presentation followed publication of a preliminary paper in Geophysical Research Letters in August (2). So, what causes the change to the rotational rate, also creating the conditions for more earthquakes to take place? There appears to be a period of peak seismic activity showing about 34 year intervals. A correlation between plate tectonics and periodic slowing of the Earth's rotational velocity (and thus length of day (LOD)) was first explored in 2004, although the paper by Varga et al questioned whether significant seismic activity might be slowing the Earth's rotation (4). The link was looked at again in 2010 by Federica Riguzzi and co-workers, with a more positive conclusion emerging from their research (5). So this new paper may not be entirely new conceptually. Nonetheless, it has sparked off a significant amount of media interest, not least because of the fairly firm predictions for 2018 accompanying it (6). You can't say you weren't warned! Stars fall into different categories, depending mostly upon their size, but also the kind of light they emit. The smallest stellar categories start at the lowly brown dwarfs (which are generally considered to be 'failed' stars), through red dwarfs, the yellow dwarfs, like our own Sun. The more massive the star, the quicker it burns its nuclear fuel, so the red dwarfs are slower burning, dimmer entities than our Sun, and despite being much smaller, will manage to outlive our star by billions of years. Similarly, brown dwarfs exhibit extreme longevity - their own nuclear processes, such as they are, are short-lived. Young brown dwarfs burn their nascent fuels up quickly, leaving a smouldering ember of a world. Essentially, then, these are already dead. Not so red dwarfs, which quietly burn their nuclear fuels seemingly forever. They can certainly outlive the 14 billion year age of the universe. So, as a result of their longevity, red dwarf systems have become a favoured location to hunt for habitable planets. Not only are these star system quiet and stable, but their long lives could potentially create the circumstances for life to evolve and flourish on warm planets orbiting the diminutive red stars. The only catch is that the habitable zone of the much cooler red dwarf stars is necessarily closer to the star than the Earth is to the Sun. This can create its own problems (1,2), but these won't necessarily offset the life-supporting advantages of the red dwarfs. Red dwarfs are common, too. There are a number of them in our immediate stellar neighbourhood (3), and these receive a fair bit of attention from astronomers hoping to find the first signs of alien life beyond our world (4). "Although it is currently 11 light-years from Earth, Ross 128 is moving towards us and is expected to become our nearest stellar neighbour in just 79 000 years — a blink of the eye in cosmic terms. Ross 128 b will by then take the crown from Proxima b and become the closest exoplanet to Earth! Well, 80,000 years may indeed be a blink of the eye in cosmic terms, but it's little consolation right now. Eleven light years out is still a fair whack of a distance right now. Proxima b is our closest 'Earth-like' planet, orbiting our current nearest star, Proxima Centauri, which is also a red dwarf. Hopes for this world were brought into question recently because it seems that its atmosphere may be insufficiently protected from the stellar wind of Proxima Centauri (1). But even if that's the case, this nearest red dwarf may still harbour other planets, commensurate with its recently discovered dust belt (2,7). As with Jupiter's appearance, the better the definition with which we scrutinise these neighbouring stars, the more complex the detail revealed. Was Tiamat Originally a Steamworld? A novel emerging theory for the accretion of gas giants may also provide some insight into the origin of the hypothetical watery planet known as Tiamat. The gas giants Saturn and Jupiter consist mostly of hydrogen and helium - gases which were in good supply in the protoplanetary nebula surrounding the newly forming Sun. So, although the 'building blocks' of these vast worlds was freely available during the early solar system, there remains the issue of the speed of gas giant formation. If gas giants form around a substantial solid rocky core, then it takes some time for the core to accrete in the first place - perhaps as long as 30 million years for a super-Earth-sized rocky world large enough to attract towards itself that much gas. Too long, given how quickly gas giants need to form before the dissipation of the protoplanetary nebula (i.e. within ~10 million years). So, the generally accepted theory effectively requires the cart to go before the horse. This has led to suggestions that gas giants instead form following the rapid formation of swarms of rocky pebbles into planetessimals, which themselves aggregate into several rocky super-Earth-sized cores spread out across the solar system, as observed for our system (1). That idea has now been expanded to include ice into the pebbles (2). The inclusion of ice creates a new dynamic of water sublimation, creating a dense atmosphere of steam around the fledgling giant world. A fledgling rocky world might form an ocean under this cloud of steam. But as the rock-ice core grows, models show that a critical point is reached where a different mechanism kicks into play. In this scenario, where the planetessimal is several Earth masses, the outer envelope of steam mixes with in-falling gases - the abundant helium and hydrogen drawn in from the surrounding gaseous nebula. 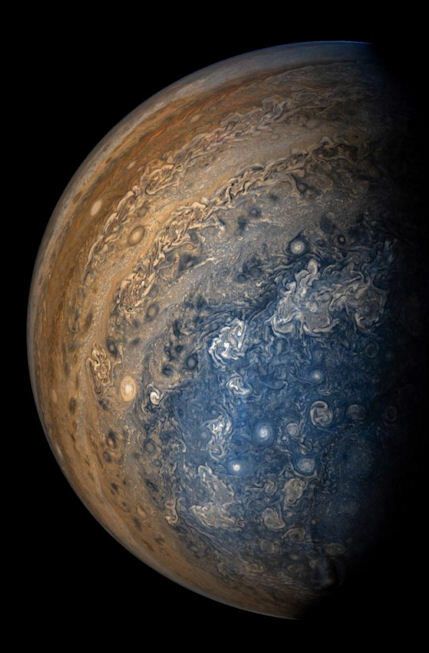 The atmospheric pressure can, under certain circumstances, allow for the formation of a super-convective fluid mixture which then further drives the bulking up of the growing planet into a gas giant. There are a number of factors involved here which complicate the picture, according to the author of the paper outlining this new model. Nonetheless, it could potentially add to the pebble theory. So what of Tiamat, the mythical super-Earth-sized watery world which is thought by some to have once occupied the present site of the asteroid belt? There have been a number of hypotheses about planets having once resided where the asteroid belt currently lies, between Mars and Jupiter. One of these comes out of Zecharia Sitchin's interpretation of an ancient Mesopotamian creation myth. In the Enuma Elish, the Babylonians describe a great battle between the powerful usurper god Marduk, and a terrible sea monster named Tiamat (4). 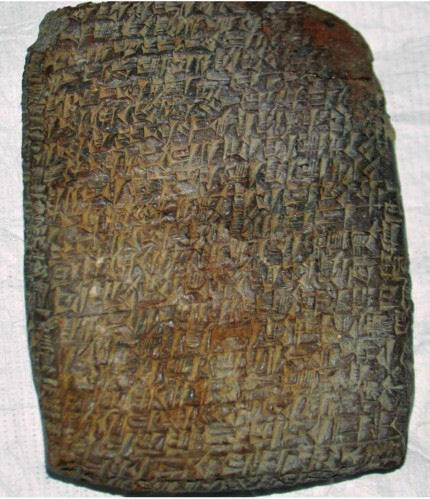 Sitchin's controversial reading of the myth holds that these protagonists were planets in the solar system - in keeping with much of the cosmological language used within the rest of the original Babylonian text (5). Yet, unlike the other more identifiable gods/planet couplets, neither Marduk nor Tiamat is apparent now. Sitchin argued that the great battle between them was a cosmic collision or encounter, which split Tiamat in two, and sent Marduk reeling out of the central part of the solar system (4). The remaining chunk of Tiamat left over from this catastrophic cosmic encounter was knocked closer towards the Sun, and became the Earth/Moon system. Marduk, a flaming planet of immense power, was lost to the outer reaches of the solar system, becoming a Planet X body. I have explained its nature in terms of our understanding of sub-brown dwarfs (6). 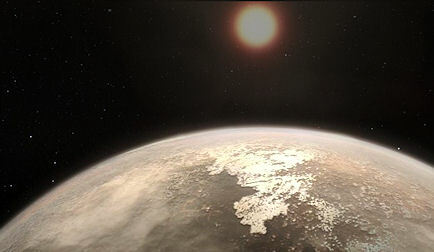 Others, including Sitchin, preferred what we might now describe as a super-Earth-like planet. So, coming back to Tiamat. The aqueous nature of this 'sea monster' deity suggested to Sitchin that this world was watery. The cosmic collision with Marduk (or one of its moons) spilt much of this water and other debris out into the solar system, becoming comets and asteroids. This, then, may explain why the constituent base of water on Earth bears such a strong resemblance to that of the outer asteroid belt (7, 8). Essentially, they were originally sourced from the same watery planet. So, in terms of this new astrophysical hypothesis about the inclusion of water ice in the rocky core of accreting massive planets, a sizeable rocky super-Earth dominated by water at that distance would be in keeping with these new scientific ideas. They would at least offer some basis for a belief that such a world could naturally form in the current position of the outer asteroid belt - but perhaps be too close to the Sun to tolerate the accumulation of the gaseous envelope which wrapped around similar cores forming further out, like Jupiter and Saturn. Mars has two moons, both of them odd. Phobos and Deimos are tiny, certainly in comparison to our rather over-sized Moon. They're also quite low-flying, particularly the irregularly-shaped Phobos. This moon orbits Mars just 3700 miles from its surface, whizzing around the red planet in less than eight hours. It's quite a dark object, with low reflectivity, and is now understood to be porous, although not entirely hollow as was once hypothesized. Phobos exhibits many craters, indicating a quite violent past. At 6 miles wide, the main crater, Stickney, is relatively large compared to the overall size of this tiny moon (Phobos averages just 7 miles across). Other craters follow radial patterns which are, oddly, not centred upon this major crater. Instead, they flow from the moon's direction of travel, or apex, indicating a succession of smaller collisions as Phobos moves through debris fields of rubble ejected up from Mars' surface following impacts there. Similarly, long troughs have have been gouged out of the moon's surface. "The High Resolution Imaging Science Experiment (HiRISE) camera on NASA's Mars Reconnaissance Orbiter took two images of the larger of Mars' two moons, Phobos, within 10 minutes of each other on March 23, 2008. This is the first, taken from a distance of about 6,800 kilometers (about 4,200 miles). It is presented in color by combining data from the camera's blue-green, red, and near-infrared channels. 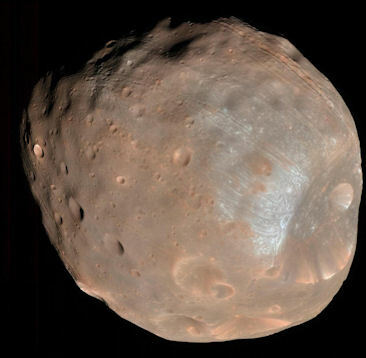 This colour image provides an artificial appearance of Phobos. The reddish surface regolith, so reminiscent of the Martian surface itself, seems to have been brushed away close to the Stickney crater, providing this Death Star-like montage. Suggestions of artificiality have been around for a long time. Calculations on the secular acceleration of Phobos, made in the 1950s and 1960s, suggested that Phobos was so light that it was most likely hollow, and therefore of artificial origin. Those calculations, by the Russian astrophysicist J.S. Shklovskii (3), were based upon varied bits of data suggesting the small moon's rate of loss of altitude was more significant than is now recognised (4). Nonetheless, Phobos does seem to be porous, as one might imagine if it is indeed artificial in nature. The prevailing scientific theory is that Phobos coalesced from rubble thrown up into orbit around Mars, following collisions against the red planet's surface. This is similar to the origin of our own Moon, although on a much, much smaller scale. ESA's Mars Express flew close to Phobos, and the tiny gravitational tug of the moon allowed mission scientists to accurately determine the moon's mass. Depending on what kind of rock Phobos is made of, its interior is between 15 and 45% hollow, distributed in a non-uniform way (5). Shklovskii would have felt vindicated by this finding, no doubt. One of those cases where a heavily debunked hypothesis in science turned out to have some truth to it after all. A Russian probe sent to Phobos was lost in March 1989 shortly after sending back images that seemed to show a monolithic 'mothership'-like structure some 20km long (6). Many argued that this UFO shot down the Russian probe, in defence of Mars or its artificial moon. But perhaps this was a cylinder-shaped component of the Phobos 2 probe falling gently away into space, and being caught on film before the probe subsequently malfunctioned? Further conjecture about Phobos concerns a monolith on Phobos (7). Looking at the official composite images of the surface of the Martian moon provided by the Mars Global Surveyor, there do appear to be at least two boulder-like prominences casting long shadows (8). Perhaps the 'missing' probes? More likely Martian boulder-sized collision debris gently adhering to the tiny moon's surface, as part of a very slow, and ultimately doomed, process of accretion. 'Doomed' because Phobos is gradually falling out of the Martian sky, and will eventually impact the Martian surface in about 50 million years time - or else break apart to form a future Martian ring. Either way, Stickney crater is filled with layers of fine dust, with evidence of boulders sliding down its sloped surface, so the chance of spotting these 'anomalous' features on the moon's surface is not particularly unexpected. Phobos has collected a good covering of rubble and dust along the way, vacuuming up materials ejected from Martian impacts. This dusty veneer has then been scraped and gouged along the way by yet more impacts, covering and revealing in equal measure. So, is Phobos artificial? Is it some kind of very ancient artificial, alien structure which, like an old shipwreck, is now covered in carbuncles and detritus - a battered and misshapen shadow of its once former glory? On the face of it, it looks like a pretty regular asteroid. But scratch just a little below the regolithic surface, and this tiny cosmic body may yet surprise us all. Lost cites abound in the Levant, it seems. The ancient Mesopotamians were fastidious about their record keeping - particularly their merchant class. No doubt with one eye on the King's tax officials. So, ancient libraries have been found packed full of literally tens of thousands of clay tablets inscribed with data about mercantile transactions. Journeys here, journeys there, goods, costs, and so on. Some of the names of the ancient cities correspond to known archaeological sites of great antiquity. But some of them don't, and these provide tantalizing clues of lost settlements from four millennia ago. But without maps, or even half-accurate distances written into these clay data stacks, it's hard to know where to start if you are a budding Indiana Jones on the hunt for ancient treasures. Now, a new technique for pinpointing these buried sites has been developed. It offers the prospect of a hoard of new ancient Mesopotamian cities, initially based in modern day Turkey. The technique uses a statistical analysis of the number of trade journeys undertaken by merchants from one city to another. On the basis of the quite reasonable premise that local trade is likely to occur more often than more distant journeys, a correlation is drawn between the number of journeys made from a particular city to the various destinations, and the distance between these points. It's approximate, for sure, creating in the first instance a series of concentric circles around the origin city within which the targets might lie. The exciting potential emerges from this data crunching when the concentric circles from the various known origin cities begin to overlap, revealing smaller Venn diagram-like common zones for the 'unknown' city locations (1). To test this method, the researchers have cross-referenced these distances between sets of known cities, to see if the projected correlation holds. Their pass rate is about two thirds accurate (2). Good enough, they think, to extrapolate to the unknown city locations, and provide educated guesses for their rough whereabouts. This work has been built upon the titanic effort involved in translating thousands upon thousands of seemingly mundane cuneiform inscriptions. This archaeological and linguistic work then meets with science in the form of statistical analysis. Remarkable, really, but will it work? The next phase requires the money to hunt for likely sites, and dig, and probably not a little luck along the way. But theirs could be a self-perpetuating enterprise: The more ancient sites found, the more the data set solidifies to provide more accurate predictions for the remaining lost cities. Any further libraries of clay tablets found along the way can only benefit this methodology further.